Crowns can be made from metals like gold, or from porcelain, porcelain fused to metal, or all ceramic. Fixed bridges, by contrast, can be used when one or more teeth are missing or need to be extracted. A dental bridge will span the gap between missing teeth. The bridge is held in place by the teeth that are adjacent to the edentulous area. These teeth are called abutments and can either be natural teeth or implants. 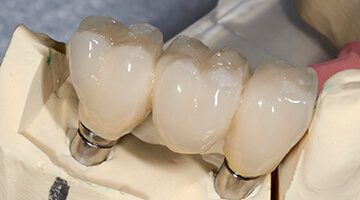 The result of a properly designed bridge is aesthetic, cleanable, and functional.